The Department of Risk Management and Insurance was established in 1985 to offer graduate level education in insurance under the name of Graduate Institute of Insurance. The blueprint for developing the undergraduate program of the Department was created in 1989. Official establishment of the program was approved by the Ministry of Education in 1990, and the first class of freshmen was admitted in the same year. Because our society is in great need of risk and insurance managers, our effort to prepare students with quality education and specialized training insures a steady supply of top-quality risk and insurance professionals. We are proud to say that these efforts have been well recognized. Through the Joint College Entrance Examination, the Department has attracted many of Taiwan’s top students. In response to the needs of profession of risk management and insurance, the Ph.D. program was established in 2003 and this program is the pioneer in Taiwan. These well-integrated programs have enhanced the Department’s ability to provide the society top-rated risk management talent. Risk Management: includes government natural disaster risk management, enterprise risk management, and financial institutions risk management. Longevity Risk and Pension: includes population aging, design of pension plan, social insurance retirement benefits, occupational pension, pension fund management, retirement saving, annuity, reverse mortgages, and other pension investment products, as well as issues related to pension management and investment. Insurance Management and Social Insurance: includes product design, marketing strategy, investment asset allocation, actuarial valuation, asset liability management and risk management of the social insurance systems and insurance company operations, and other issues related to bancassurance and life settlement. Finance and Insurance Regulations and Supervisory Mechanisms: includes issues related to finance and insurance regulations, designing early warning system and supervisory mechanisms. Finance Products Innovation and Development : includes issues related to Innovation and development of life insurance, property & casualty insurance and asset management. * to undertake high quality research in all fields related to pensions. * Pension fund management and performance. * Pension funding and valuations. .
* Pension law and regulation. * Pension accounting, taxation and administration. Cass Business School is an integral part of City, University of London. Sir John Cass Business School is among the global elite. We are consistently ranked amongst the best business schools and programmes in the world. Further Cass holds the rare gold standard of 'triple-crown' accreditation from the Association to Advance Collegiate Schools of Business (AACSB), the Association of MBAs (AMBA) and the European Quality Improvement System (EQUIS). Together with an established 50-year reputation for excellence in business research and education, Cass attracts outstanding academics, students and businesses worldwide into our energising Cass community. Mission statement. At Cass, we help individuals thrive in a dynamic, interconnected world. We blend cutting-edge theory and practice, inspiring our vibrant London home, while engaging our international network. Among the leading global business schools, the Cass approach is uniquely energising; personal yet global, intellectual yet practical, passionate yet disciplined. Resulting leadership enables agility, distinction and sustainability. https://www.cass.city.ac.uk. Given the recent trends of business integration in the global financial market, the finance industry is facing intense competition and operating stress. The passing of the Financial Holding Company Act in Taiwan led to greater integration between the banking, insurance, and securities industries, and also brought about drastic changes in the traditional business model of the insurance industry, thus leading to many opportunities and challenges. The vigorous development of bancassurance has been one of the most important market trends amidst the rise of cross-marketing activities between banks and the insurance industry. For insurance companies, cross-marketing through bank channels in recent years has effectively increased the size of the market, but it has also brought many associated management problems. Therefore, this research and development center was established in order to improve the service quality of insurance service products at banks, and to strengthen the order of the overall financial market. Its purpose is to promote bancassurance practices and academic research as well as improve the quality of bancassurance; train bancassurance professionals and become a marketing channel research center for the integration of domestic financial products; expand the sharing and exchanges of bancassurance knowledge and experience; and provide advice on the supervision and management of bancassurance policy and advisory services to assist in the promotion of sustainable development in bancassurance. In order to promote the continuous and steady growth of the insurance industry, to fully leverage the industry’s economic and social benefits, and to balance the interests of intergenerational consumers, employees, shareholders, and other stakeholders in the insurance industry, the Research Center on the Sustainable Development of Insurance Industries has been established to act as a communication platform and think tank among industry, government, and academia. This research center will combine faculty from National Chengchi University and other universities, elite members of the financial industry, the professionals from governmental institutions such as the Financial Supervisory Commission. Issues on the sustainable development of the insurance industry will be compiled, and recommendation reports on development strategies will be created. Relevant training and the promotion of education and training courses will also be conducted to assist in promoting the sustainable development of the insurance industry. 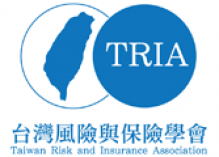 Taiwan Risk and Insurance Association (TRIA) is jointly organized by academic departments of Risk and Insurance domestically. The purpose is to promote the academic exchanges of Risk and Insurance in Taiwan. This is an academic and cultural group.The Association consists of college students and teachers, experts of the insurance industry, managers and practitioners in the field of Risk Management and Insurance. The annual academic seminar will be held annually to provide a place for people publishing the research result, the thesis, the industry experience and so on. In the future, TRIA will strengthen the academic cooperation with Asia-Pacific Risk and Insurance Association (APRIA) and American Risk and Insurance Association (ARIA) to expand the international vision and visibility of the insurance research in Taiwan. The Pension Fund Association was founded in June 29th, 1999. Members of the Association include the representatives from the three major pension funds in Taiwan (Labor Pension Fund, Labor Insurance Fund, and Public Service Pension Fund), government agencies, scholars, asset management companies, private insurance companies, and Securities investment Trust & Consulting Association. The Pension Fund Association aims to promote the development of the pension system and the pension fund management, provide professional suggestions on pensions, encourage academic research on pensions, share experiences in pension fund management, and hold academic seminars and international activities. The goal of the Association is to solidify the cooperation among industry, governments, and academia so as to improve the pension fund management in Taiwan. Current Chairperson, Ms. Grace Lee, took the position in June 2014. There are three committees (Public Relation and Active Committee, Research Development Committee, and Education Promotion Committee) in charge of the operation of the Association.